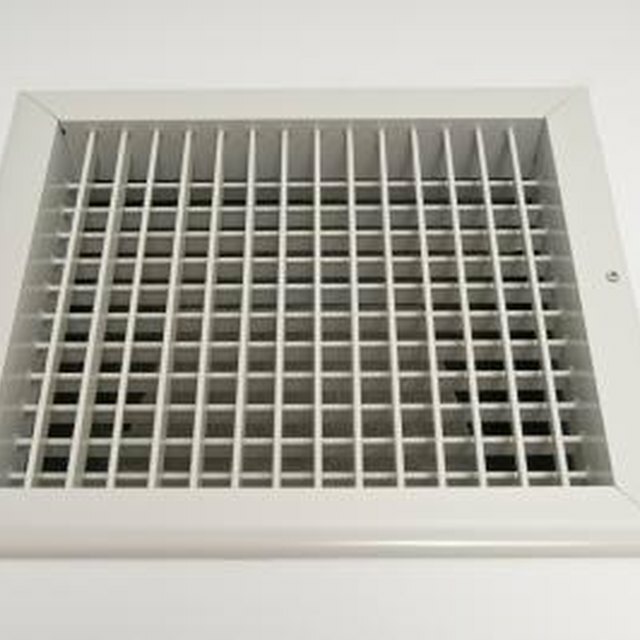 Bathroom exhaust fans eliminate steam and fog and make quick work of unpleasant odors. Without a proper exhaust fan, your bathroom can become a breeding ground for mold and mildew, and excess moisture can lead to peeling paint and wallpaper. Get the most out of your bathroom fan by choosing its location carefully to maximize efficiency and ensure a successful installation. All bathrooms should have at least one exhaust fan. For maximum effectiveness, install your exhaust fan as close as possible to the bathtub or shower, suggests Air King Limited. This Old House recommends placing the fan between the shower and the toilet to ensure the fan can tackle both odors and moisture. If you're installing a fan in a powder room, choose a spot directly over the toilet. Finally, keep your exhaust fan far from windows, doors and other fresh air intake points whenever possible. Installing an exhaust fan in the shower helps direct moisture out of the bathroom quickly and effectively. Unfortunately, not all exhaust fans are safe for in-shower installation. Before considering a shower fan, check the label to make sure the unit features an Underwriters Laboratory listing and a ground-fault circuit interrupter, which helps to reduce your risk of electrocution. While some bathroom ceiling fans with built-in lights are designed for shower use, all units with heaters should be kept out of the shower. While the optimal place for your fan is near the shower, it's important to consider installation requirements to choose the best location for a bathroom fan. Some larger units feature braces designed to span the area between two joists for extra support, while other smaller fans may fasten to just one joist. The presence of duct work, pipes or wires in the ceiling can also impact where you place your fan. Finally, consider the venting requirements for your fan. This Old House recommends placing bathroom fans no farther than 6 feet from where the exhaust will exit your home and keeping duct runs as straight as possible for more efficient exhaust. Keep an eye out for obstructions in the attic and in the exterior walls of your home as you decide where to install your fan. While many bathroom fans are designed for ceiling installation, some units can be installed in the wall if necessary. Check the installation instructions for each fan before you buy it to find out if it can be installed in the wall, and mount the fan as high as possible on the wall to maximize effectiveness. Keep in mind that most heated or lighted fans are not designed for wall installation. Are Suspended Ceilings OK Above a Shower in the Basement?